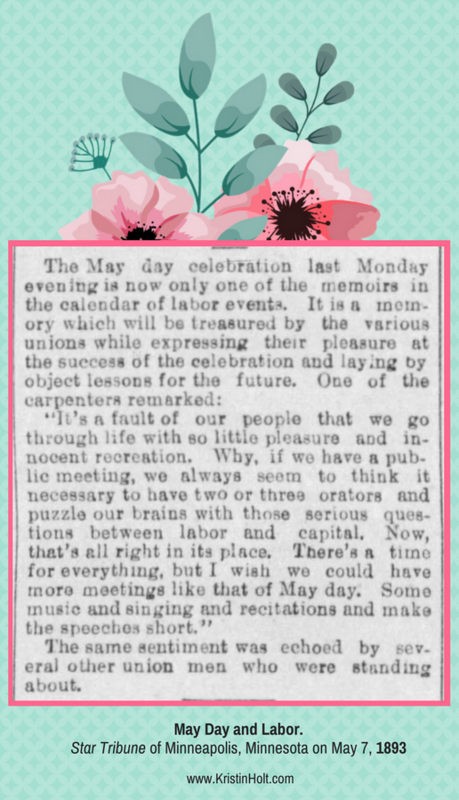 May Day falls on the first of May, and has been an occasion for celebration on various continents since at least the 13th century. 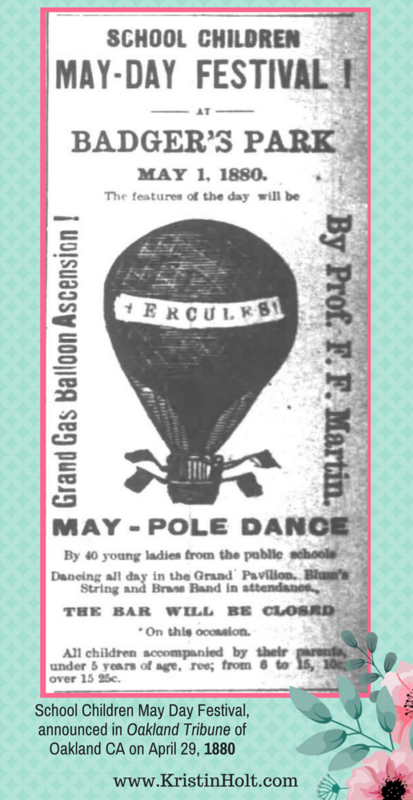 Today’s world has long-forgotten most of the lore surrounding May Poles and Beltane (pre-Christian holiday of rebirth and fertility). Have you read Upton Sinclair’s The Jungle? Or Jack London’s The Iron Heel? I read The Jungle in high school—and some of those dastardly images are still engraved on my brain. What was Sinclair trying to do? Effect reform in the workplace. The late nineteenth century was fraught with workers’ battling their powerful (and moneyed) employers for shortened work hours, shorter work weeks (who wants to work 14 hours a day, 6 days a week?). Finally, in the late 1880s, organized labor unions triumphed! An 8-hour work day was here to stay! 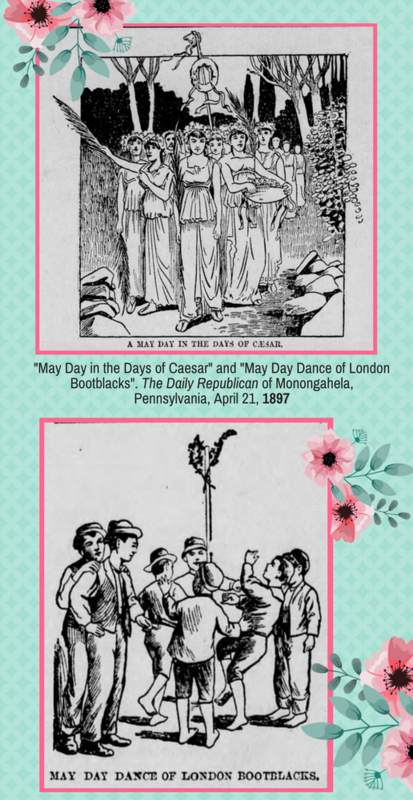 (For much more, see Eric Chase’s The Brief Origins of May Day). None of this is odd. In fact, most of us are glad our late nineteenth century ancestors worked out the long work days, employment of children in factories, and many other less-than-appealing truths in American history. Americans loved “May” so much, they named their daughters “May”. Okay. Not all that bizarre. Until you consider those whose surnames were Day. 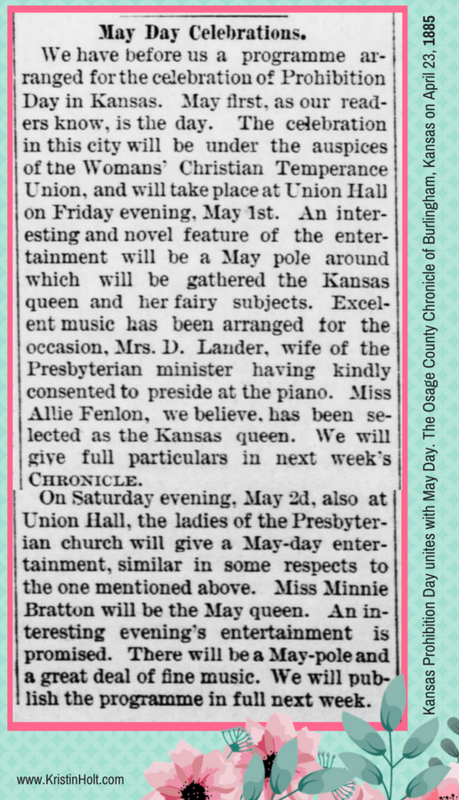 If your parents, Mr. and Mrs. Day gave birth to you, a daughter, would you—seriously—want to be named May Day? (Keep in mind that the “help! help!” call: Mayday didn’t show up until 1923, and then, the SOS signal had nothing to do with “May Day”... it simply sounds like the French “Help Me”: venez m'aider. So little girls running around the neighborhood, sought by their parents with a “May Day!... wouldn’t necessarily raise a panic. 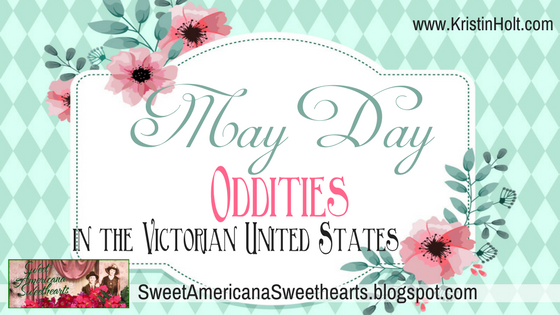 Is it odd to name a child “May Day”? We’d love to hear your thoughts. Please scroll down and comment. Victorian Americans Observed Groundhog Day? Thanks for reading! Please scroll down and comment. Your thoughts are valuable! Great post, Kristin. So much fun information. You and your research--always fascinating. Thank you so much, Doris. Always a treat to see you stop by. Your kind words feel so good! Enjoyed this! Brought back memories. I remember being in a ballet dance recital when I was young and dancing around a Maypole with a group of other dancers. Thank you, Kathryn! What a fun memory. Our lives are steeped in many longstanding traditions, many I didn't know the origins of. 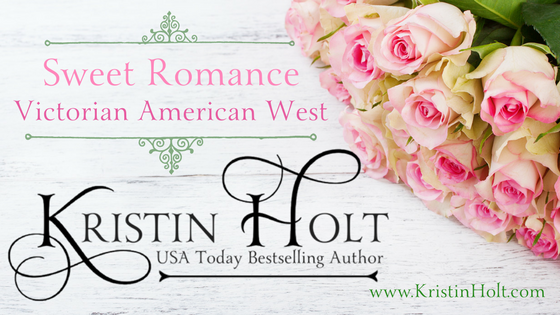 Thanks so much for stopping by, reading, and commenting.